BOOSTCONTROLLER2 FuelTech's BoostController2 is a multi-stage equipment which precisely manages up to 6 stages of boost and an extra launch stage, allowing the eficient and precise traction control for cars and motorbikes. It works controlling the top end wastegate pressure an it's possible to determine a dual ramp turbo pressure growth to set a smoothly turbo load at shifting, turning the engine's power generation ideal for the traction levels. 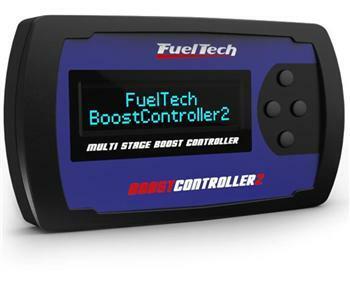 To work with high boost levels in racing applications, the BoostController is able to work together with a CO2 reservoir, keeping the appropriate pressure and traction controls. GEARCONTROLLER - 16x2 characters OLED display and buttons that allow programming directly on the unit. No computer needed - Active traction control by wheel speed (compatible only with FT300, FT350 and FT400) - Retards ignition timing to control power on the wheels and cuts ignition on extreme situations - Full throttle gear change with no clutch use, keeping constant torque and reducing time under no acceleration (power-shift function)* - Individual gear cut time per shift - Compatible with stock shift levers (contact us to check compatibility prior to acquisition) - Power shift function can only be used on dog engagement gearboxes - Ignition cut gear change feature can be used with any aftermarket EFI brand that has 2 step limiter input. *for active traction control feature, it is required to be used with any of the FuelTech FT300, FT350, FT400, or FT500 EFI.